LOESCHE could now once again place one of its vertical roller mills on the Filipino market. 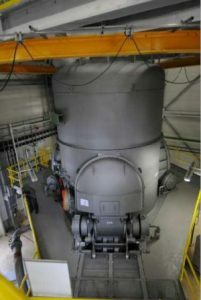 For the first time, the local cement manufacturer Eagle Cement Corporation ordered a LOESCHE vertical roller mill for its plant in Barangay in San Ildefonso – 50 km north of the capital city of Manila. The coal mill for line 3 of the cement plant will ensure the fuel supply and is designed for grinding coal and pet coke with a capacity of 54 t/h of mixed coal or 34 t/h of pet coke. The grist is ground to a fineness of 12 % (coal) or 3 % (pet coke) sieving residue with 90 µm. The scope of supply also includes an LSKS-classifier and corresponding filters, blowers, an inertisation unit, the gas analysis and the main drives – all components are to be delivered before the end of the 2017. One benefit is that the coal mill operates with a low differential pressure and therefore has a significantly lower energy consumption than typical solutions. In addition the Eagle Cement Corporation (ECC) was impressed by the distinctly good price-performance ratio and the close customer contact developed over years. The cement plant in San Ildefonso has been operating since 2010.